During the holidays, millions of underprivileged children go without their wishes being fulfilled. Family Giving Tree is doing an amazing job of providing for tens of thousands of such children in the Bay Area, but there are a lot of technological barriers that make their job difficult, and sometimes gifts don't get in the hands of the kids. Introducing Santa, an app that integrates the Sleigh and RFID systems to make the process of getting kids gifts seamless. We begin by tagging all of the "wishes" in our database with necessary parameters. Most importantly, we assign a QR code to each of the wishes so that they can be tracked physically and digitally at all times. All you have to do is scan the wish tag with a smart phone or computer. We then built a ride sharing system that will text nearby drivers when a donor needs help getting their gift delivered to the warehouse. Finally, volunteers can easily change the status of the gifts by scanning them. Our app is open source and leverages several open source JQuery libraries to make a fast and easy-to-use interface for the donors, drivers, and volunteers. 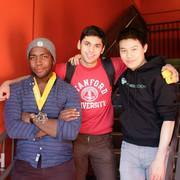 The best part is that the app is extensible to multiple charities — we designed it such that all we need to do is input data from the charities and the app can handle the ridesharing process. 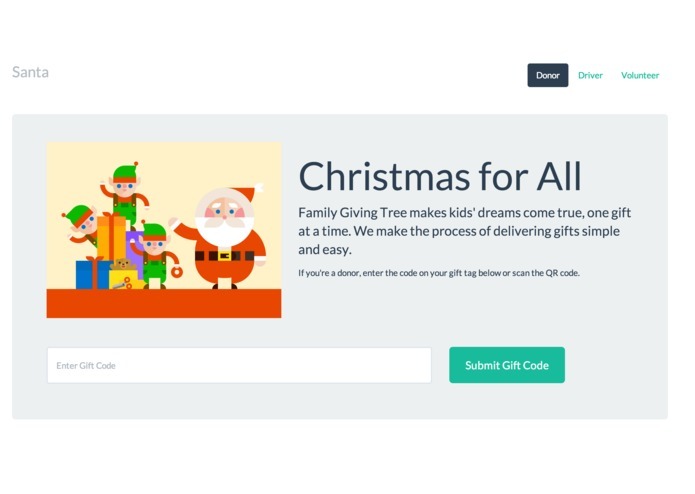 We're helping Family Giving Tree simplify their distribution process so that they can focus on putting smiles on childrens' faces during the holidays.